While admitting that the challenge upon Chandika Hathurusinghe is humongous, Sidath Wettimuny, the much respected former cricket administrator, says the new Sri Lanka national team coach’s job is somewhat cut and dried. He said, “Right now there is no new low for our cricket to plunge to; so now from this point they can travel only in one direction — up”. I thought if Hathurusinghe is going to be complemented and supported — the only way that we could do is by talking about the realities and not about trying to create a modern-day Superman or a messiah. I know he is a professional who could see through the emperor’s new clothes, if he so wishes to be superman let it be done through results which would talk for themselves. The concept of a professional coach in Sri Lanka was initially conceived by Ana Punchihewa – the then President of the Board of Control for Cricket in Sri Lanka in 1994 when we were still a fledgling cricketing nation in spite of being in the big league. But, at that point of time there was something going for them. The Sri Lanka team under Arjuna Ranatunga was loaded with talent and much better talent than the present outfit which has done the marathon running backwards in spite of all the professional help along with the ‘brain centre’ at their finger tips. Even in the pre-1996 era yes, Sri Lanka lost matches, but, these losses came against formidable opponents. At home, the Sri Lankan team was still on the learning curve after gaining Test status in 1982. Yes, the Lankans lost to good sides and full member states after a tough fight. Yet, during the last few months Sri Lanka has lost to Scotland – who has no full Test status, while Bangladesh and Zimbabwe are considered just minnows. Punchihewa, talking about his vision at that juncture, said, “It was not that our Lankans knew less cricket than an outsider from another land, but, it was the embedded culture of approaching situations that was prevalent — with influential persons trying to introduce names into the selection list. That was the foremost shackle that had to be broken. When Davenell Whatmore landed in Sri Lanka as our first overseas coach he brought some pluses along. First was; in his heart he was part Lankan because he was born here. Yet, he was unfamiliar to the Lankan way of handling matters because he grew up to be a cricketer under Australian influence. 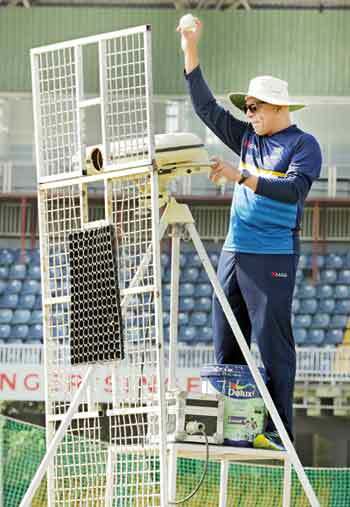 Besides, he also had some modern Australian coaching gimmicks which we Lankans were alien to. 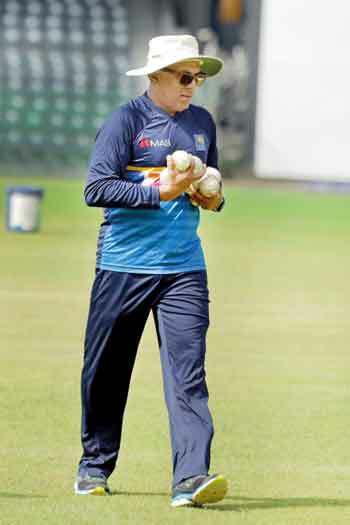 So, for Manager Duleep Mendis and captain Arjuna Ranatunga this became a workable combination”. Similarly, we believe Hathurusinghe also has some pluses in his bag. First is that if things do not work out, he could always take the next plane home to Sydney where he has a good home which he looks after dearly. The next is that prior to placing his signature he has agreed upon some of the clauses that he could use for his advantage — like the right to tinker with the selection process. Nevertheless, there are some grey areas that is a bit bewildering. Quite rightly Hathurusinghe has been given the authority to get involved in matters pertaining to selections. At the same time there is another authoritative selector in Asanka Gurusingha who is also the professional team manager. Then there is a chief selector in Graeme Labrooy. Now out of the three individuals, who has more clout? As we have been made to understand, Gurusingha also acts as the cricket committee chairman. This is one junction where you may find a few cross roads and who will have the right of way is left to be seen. Interesting indeed! We are sure that neither the Sports Minister nor the Sri Lanka Cricket President would do much tinkering as before. In reality we may not find the national team being hauled back from the team bus from the airport or the selectors hauled up before parliament to discuss team selections. At least for the time being, they both are not in a position to grapple with the million dollar acquisition. But, still certainly the developments within may spark off dissension. Then come the changing of the dressing room culture. It’s too early for Hathurusinghe to tackle that problem; I mean, prior to the engagement against Bangladesh. But, I know for sure that he should have a chat with them and speak to them fittingly. To some, he may be harsh and with regard to others, he may chat with them patiently and try to reason with them while some others may get a kick on their hind softie. While having that chat he must prioritise his vision and where he wants Sri Lanka cricket to travel and the time frame that he is looking at. From 2015 up to date, we have lost all aces and within this period we have lost our bite in cricket. Just for instance, we had a record seven captains during that period. Namely Angelo Mathews, Rangana Herat, Dinesh Chandimal, Upul Tharanga, Chamara Kapugedera, Lasith Malinga and Thisara Perera. This is going to be Hathurusinghe’s first challenge: Choosing a captain who would not only lead the side to the next World Cup in 2019, but, a captain who could command respect – a captain who is respected even by the SLC management. If not the captaincy went by a kiss. If someone was willing to commit to political favour like what happened in Pakistan, the captaincy went by that. Yes, Thisara Perera was sufficient to lead the side for a T-20 match when the other seniors declined for more reasons than one. But, to get Perera to lead the ODI team was committing cricketing hara-kiri. Dinesh Chandimal who has an ODI batting average of over 32 cannot find a place in the ODI team but, they selected Perera to captain when his ODI batting average is less than 18. Some say it’s going to be Chandimal for all three formats, I wonder what the undercurrents would be regarding such a move. I know of at least one big wig in the SLC set-up who thinks that Chandimal is no good a captain. Then at the Hathurusinghe press conference the head table was pointing out that they could not find fault with the Lankan team for losing against India because right now Indian cricket is high-riding. It’s clearly the wrong end of the stick. We must only aspire, but in reality, we also must make beating India a habit. Right now India is looking mostly to play the big guns in cricket – England, Australia and South Africa. Others will be obliged only by the ICC requirements. This means minnows will get only two Test matches and Three ODIs and the present performance of the Lankans in India has added credence to that argument. Yes, winning the tournament in Bangladesh next month may be a personal achievement for Hathurusinghe, but, what we need from him is to bring back Sri Lanka cricket to the pre-Sumathipala era. Yes, Hathurusinghe is a highly paid professional and positive results is a job requirement of his. Sira epitomized Sri Lanka Football psyche!